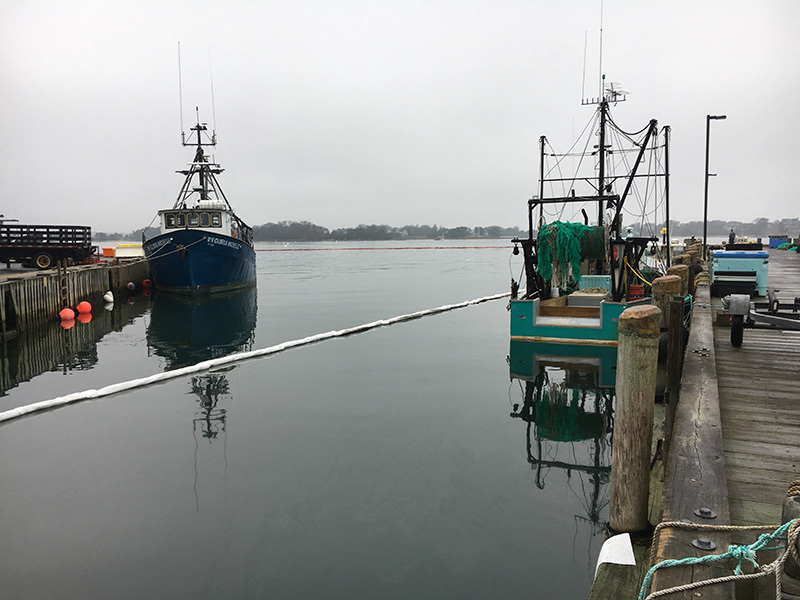 An oil spill discovered in Woods Hole has been contained and is being cleaned up, U.S. Coast Guard spokesman Nathan Mendes told The Times. The spill was first reported at 1:13 pm Sunday, not far from the National Oceanic Atmospheric Administration aquarium, Mr. Mendes said. When the Coast Guard investigated, there was a sheen in the water, but no responsible party at the scene, he said. An official from the state Department of Environmental Protection (DEP) emergency response team responded to the spill on Sunday, spokesman Edmund Coletta told The Times. The official oversaw boom and absorbent pad dispersal at the scene, he said. Mr. Coletta described the incident as “quite a large spill” of a petroleum product that appears to have come from a bilge. Two DEP emergency officials remained at the scene on Tuesday, he said. Because no responsible party was at the scene, the money for the cleanup will come from a federal Oil Spill Liability Trust Fund, Mr. Mendes said. That money comes from a tax on domestic and imported crude oil, according to the federal Environmental Protection Agency website. But should the Coast Guard’s separate investigation yield a responsible party, that individual would be responsible for three times the cost of the cleanup, as well as civil fines and possible criminal charges, he said. Law requires mariners to notify federal authorities of a fuel spill. At this time there is no estimate of the cost of the cleanup, he said. Sea Tow will provide an itemized bill once the cleanup is completed. Seven waterfowl are confirmed dead from the polluted water, Mr. Mendes said. Federal and state wildlife authorities have been notified, he said. Mr. Coletta confirmed the Coast Guard report that a number of birds were “oiled” and succumbed. The time of year has made it a little easier to clean up the site, Mr. Mendes said. “There isn’t any tourist traffic, and the overall impedance to boat traffic is minimal,” he said.